Who has run already 10 or 20 City marathons may be bored to run more of them. But boring must not be because you can search new challenges with adventure runs. This challenge could be a cross coutnry marathon, mountain marathon, ultra marathon or a long run which last several days. 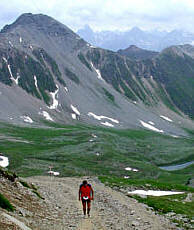 Do you know also adventure run which we should recommend on this page. If yes send an email to us. Isn't it boring for you to run each year a city marathon? If yes then you take a look on the following list of adventure runs! :-) We wish you much fun with adventure running! Start Whitehorse Canada - Yukon Territory. 3 days Team run through the Graubündner Alpen in North East Switzerland. 100 km Mountain - Ultra through the Chiemgau 07/2011 100 km through the German Alps in Chiemgau. NCL Ultra Berlin - Rom 05/2011 Berlin - Rom www.ncl-stiftung.de.